With fall quickly approaching, hurricane season is now upon us. One of the season's first big storms, Florence, is expected to make landfall on Sept. 13 along portions of the coastal southeastern region of the United States. 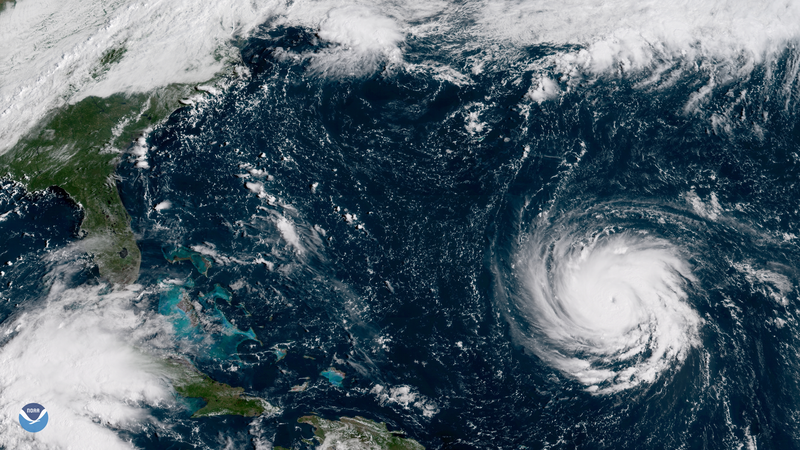 As the country prepares and awaits the storm's arrival, pictures of Hurricane Florence from space show how serious the storm is expected to be. As of Sept. 11, the National Weather Service (NWS) and National Oceanic and Atmospheric Association (NOAA) have issued warnings and stressed that the storm is not getting any weaker. According to a National Hurricane Center (NHC) advisory posted on the agency's website at 11 a.m. ET on Tuesday Sept. 11, Florence is currently rated as a Category 4 storm with winds at around 130 miles per hour. "Florence is expected to begin re-strengthening later today and continue a slow strengthening trend for the next day or so," the advisory reads. "While some weakening is expected on Thursday, Florence is expected to be an extremely dangerous major hurricane through landfall." And it's only projected to get worse. According to the NHC, the storm hasn't reached its peak yet, per CNN, and is expected to reach Category 5 status by Wednesday. The coast of North Carolina is expected to be hit with the brunt of the storm, with South Carolina and Virginia also hard hit. But the storm is anticipated to bring rain and higher wind speeds to a larger swath of the East Coast per the NHC, with the rain map extending from South Carolina up through New York. Video clips below from the NOAA Satellite feed on Twitter show the storm churning away. "Don't concentrate on the exact forecast track of Hurricane #Florence," the NHC tweeted on Monday, Sept. 10. "Significant effects will extend outside the cone, and will arrive at the coast sooner than the eye." In a video, National Hurricane Director Ken Graham explains that many parts of North Carolina could see as much as 30 inches of rain. By comparison, 2017's Hurricane Harvey dumped a record-breaking 51-plus inches of rain in the Houston area. Those tuning in to the projections for Florence might be reminded of the spate of particularly detrimental storms that hit southeastern U.S. and the neighboring regions last fall. In August 2017, Hurricane Harvey battered Texas, Louisiana, and the neighboring areas with 50-plus inches of rain and tied with 2005's Katrina as the costliest tropical storm on U.S. record, causing the country $125 billion in damage. Shortly after, Hurricane Irma tore onto the southern Atlantic and Gulf Coasts, and came in at fifth costliest hurricane with $50 billion in damage in the U.S. alone, according to the NHC. And the marks left by monster Hurricane Maria, which primarily struck the Caribbean, are still lingering. The U.S. cost alone topped $90 billion, and the storm's aftermath in Puerto Rico caused nearly 3,000 deaths, per CNN, a gross underestimation from the 64 casualties that the government had initially reported. (This higher figure was in line with the findings of a George Washington University study released at the end of August 2018.) Despite nearly $4 billion spent on restoring electricity to the island, parts of the area still remained without power as of July 2018. That same month, the Federal Emergency Management Agency (FEMA) admitted it was underprepared for the intensity of the 2017 hurricane season. Local governments in the storm's path have been urging residents to prepare this week, and over 1 million Americans in high-impact areas of North and South Carolina and Virginia have already been ordered to evacuate, per NPR. On Tuesday, Gov. Roy Cooper of North Carolina issued a mandatory state-wide evacuation for residents. Additional optional evacuation orders are in effect for other areas. Those in affected areas are urged to heed the instructions of government officials to ensure public safety. FEMA has a guide for hurricane evacuations for how to prepare and stay safe before, during, and after a tropical storm hits. Stay safe, everyone.